The township of Carlisle (township 133, range 44) was organized February 24, 1881, by the commissioners upon receiving a petition of a majority of the legal voters of that congressional township. The first election of township officers was held at the house of Martin Hexam on the 14th of the following month. The petition asking for the organization of the township carried the names of the following qualified electors of the proposed township: Jacob Kiewel, Martin Hexam, A. O. Grotte, Charles Spilman, R. Fautch, Ludwig Weber, Mathew Fautsch, Simon Giser, Oscar Porson, Oly Olson, Vincent Mynek, O. O. Dahlby, Hans C. Salhre, S. Johnson, Ole N. Nykus, Nils N. Nykus and Nils O. Garnor. Carlisle township was the fifty-first township to be organized. This was due to the general swampiness of most of the land and the difficulty of draining it without going to great expense. Two large lakes and a number of smaller ones are found in the northern part of the township. The Pelican river meanders into the township along the eastern side, but passes out before it reaches the southern line of the township. The elevation of the township above sea level ranges from one thousand feet in the southwestern part to thirteen hundred feet in the northeastern portion, with a general average of about twelve hundred feet. 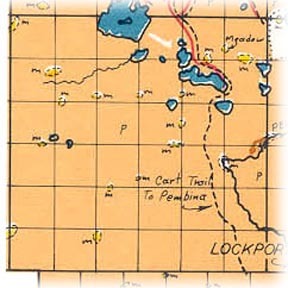 Two railroad lines touch the township, the Great Northern cutting across the northeastern corner and the Northern Pacific running nearly the full length of the township on the south. The village of Carlisle is the only station on the former and French has a similar honor for the other railroad. Carlisle was platted on section 2 by Robert Miller for Peter and Marcus Mauren and the plat recorded on December 20, 1879. The present township officers are as follow: Supervisors, William Zimmer, O. M. Hexum and J. J. Tomhave; clerk, C. Evjen; treasurer, Frank Fjestad; assessor, E. Fjestad; justice, E. Fjestad; constable, C. Evjen. Places of birth for Carlisle Township in the 1905 state census.